Even though I don’t drink any beer myself, I know that beer is taken very seriously in Texas. In addition to “Shiner Bock” there are a lot of micro-breweries putting out their product, and while the alcohol content of around 8% makes the calorie count pretty high, a lot of triathletes enjoy a nice beer after a hard training session .. or just to relax. Of course Germans take pride in their beer as well, and breweries sponsor a lot of big sporting events and teams. In the last few years, the German brewery “Erdinger” has supported an Endurance Team consisting mainly of German athletes such as the Raelert Brothers and a few internationals like Eva Wutti or Lucy Gossage. The name of the team – “Erdinger Alkoholfrei Endurance Team” – indicates that the main product they are highlighting is an alcohol-free version of their “Weizen” or wheat beer. Most who have tried it like it as a refreshing, mineral-rich hydration after a long, hard session (or race). With Julia Gajer and Nils Frommhold two Erdinger athletes will be racing at Texas on May 14th. There are a lot of similarities between these athletes: Both have won IM Arizona (Nils in 2012, Julia in 2013), were 6th in Kona 2014, are coached by Wolfram Bott, had great results in the 2015 summer – but had disappointing races in Kona. Both are looking to score the points needed for a Kona slot but are also serious contenders for the win. After finishing 6th in Kona 2014, Nils validated his 2015 Kona slot in the Regional Championship in Melbourne in March. With Luke Bell he built an 11-minute lead into to T2 and was in the lead until about 30k into the run when he started to struggle. He still managed to finish in fifth place. While not satisfied with the result and the frustrating end to his race day, it allowed him to focus on doing well at Challenge Roth in the summer. For German athletes winning in Roth is the next best thing to winning in Kona. There is a fierce competition between Ironman Germany in Frankfurt and Challenge Roth for the “most important” German race – usually Frankfurt draws a deeper field as a Regional Championship, but Roth consistently has the faster times and always has at least a handful of “big names”. Nils had raced Roth in 2014, finishing second only to Timo Bracht and barely missing the 8-hour mark. Winning Roth has always been one of his goals, and he delivered a fantastic race: While Andy Starykowicz tried to race away from the rest of the field, Nils matched his pace and when Andy started to struggle towards the end of the bike, Nils was able to build a 2-minute lead into T2. Similar to 2014 Timo Bracht had the best marathon, but even his 2:45 was only good enough for second place: Nils had a very solid 2:51 marathon and won Challenge Roth 2015 with a time of 7:51, the third fastest time of all IM-distance races in the whole year. After that career highlight Nils was very motivated for the rest of the season, but he wasn’t able to have a good race after Roth. He raced the 70.3 Championships in Zell am See and was in the second group on the bike. But when he tried to split the group on a climb, he ran out of steam, wasn’t able to put together a decent run and dropped back to 22nd place. 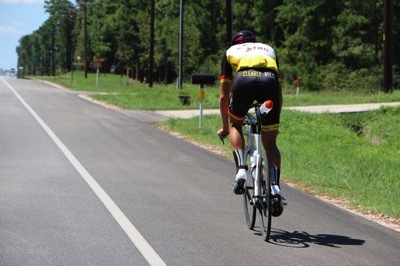 To prepare for Kona he went to the heat of The Woodlands, Texas, with his coach Wolfram Bott and a number of other athletes. He felt the training went well and was looking forward to race well in Kona. He was in a good position after the swim but had a flat early in the bike. After a quick fix he tried to race back to the main group but just wasted a lot of energy without making up much ground. He fell back even further on the climb to Hawi, but still went on to finish the race in 29th place. His 2016 first race also didn’t go according to plan. Nils took the long trip from Europe to race the South American 70.3 Championships in Palmas. He thought a Top 3 was a possible result for him, and was part of a three-men bike lead group, but coming from a long European winter he was not ready for the humidity and heat. Once again he struggled in the latter part of the bike, couldn’t run well off the bike and dropped back to 8th place. While Nils has been coached by Wolfram Bott for a long time, Julia only started to work with Wolfram after her sixth place in Kona 2014. Both Julia and Wolfram were cautious with their expectations for the 2015 season and were mainly focused on 2016. But things went really well from the start: Two second places in 70.3s (behind Daniela Ryf in Mallorca and Camilla Pedersen in Kraichgau) lead to a win at 70.3 Luxemburg. She went on to race well in the Frankfurt heat at IM Germany, finishing second behind a dominating Daniela Ryf but in front of Caroline Steffen. When she finished 6th in the 70.3 Champs without a dedicated preparation, things seemed to be clicking much faster than planned and she had high expectations for Kona. For Kona 2014 Julia prepared at home in Germany and was a solo traveller to Kona until her parents and husband joined her just for the race. Things were much different for 2015: She prepared in the Texas heat with the Wolfram Bott training group and had a number of obligations after arriving in Kona. She was hoping for a similar result as in 2014, but she knew there were a lot of Top 10 contenders in the race. 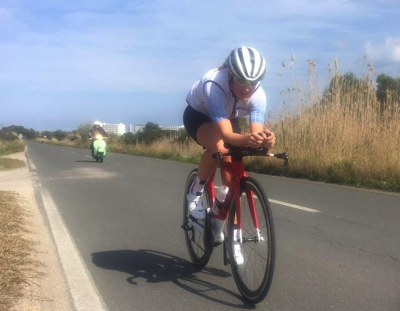 However, she was not able to fight for a good finish – with bike shoe issues she was never able to put out decent power on the bike and was dropping further and further behind. Shortly after T2 she retired from the race. She was pretty frustrated and after a few days of sightseeing in San Francisco she decided not to end her season quite yet but to race another IM in November. Julia prepared in chilly Germany for Arizona which is usually a pretty warm race. The weather in Tempe turned out to be cold and rainy. Julia never really got going, but still managed to place herself in second place on the bike and into T2, but never started to close the gap to Meredith Kessler who was on fire and ended up posting the fastest 2015 Ironman. On the run Julia lost one spot to Amanda Stevens who ran well while Julia slogged through the marathon. When she heard towards the end of the race that her gap to fourth place Darbi Roberts was shrinking she rallied a bit to hold on to the last podium spot. She was relieved that the race and her season was over. In the off-season Julia moved to Austria (her husband took a new job there) and continued to work on her equipment. With Cervelo as a new bike sponsor she had some more options to further tweak her bike position and is very happy with the new setup. She started her 2016 racing with another cold race: 70.3 Pays d’Aix. Cold winds on race morning lead to a cancelled swim and a time trial start with 20-second gaps. Even with arm and leg warmers it took her 20k on the bike to properly warm up. By then she was more than five minutes behind eventual winner Tine Deckers who had a very strong bike. The rest of the bike went much better and she didn’t have too many problems in the strong cross winds. She was in fourth position in T2, and the fastest run allowed her to claim second place. As it was her first race of the season, she was quite happy with her performance. Nils and Julia have almost the same goal for IM Texas: They “just” want to have a solid Ironman race. For both of them that includes a decent swim (i.e. starting the bike in the front group), a steady bike and a solid marathon that puts them in a position to fight for a podium spot in the last 10k of the race. If they manage that, they should also be able to secure their Kona slots. Nils now sits at 865 KPR points, so if he wants to defend his Roth title in the summer (he is on the start list), he has to get the majority of his qualifying points from a good race in Texas. With the cutoff expected to be at 3.500 points for the men, Nils needs a third place (2.890 points leading to a total of 3.755 points) to be reasonably safe for a July slot. There are also eight to ten athletes that can beat Nils when they have a great day so it is hard to predict where Nils will end up, but with a solid race a podium finish is a reasonable goal for him. If he manages to have a great day, he could even be in a position to win the race, but Nils is a bit anxious to race in the heat. 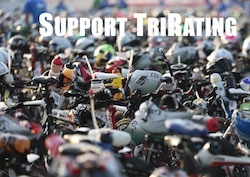 He hopes that with some adjustments he can break his string of sub-standard races in warmer temperatures. With regards to Kona qualifying, Julia is in a better position than Nils. She already has 3.450 KPR points, so with the cutoff around 4.500 points she’ll be safe for a Kona slot with at least a seventh place (1.335 points) in Texas. Unless she runs into problems in Texas, that’s the base goal for her – if things go well, she’ll be racing for her second Ironman win. After racing twice in cold conditions, Julia looks forward to the Texas heat – with the exception of Kona she has always been racing well in the heat. Her second place at the start of the season was encouraging to her and she very much looks forward to have a good race in Texas. As for the beer company that sponsors Julia and Nils, it’ll be quite some time before “Erdinger Alkoholfrei” will be a legitimate challenger for the top beer in Texas. Even if they face strong competition at the North American Championships, both Nils and Julia clearly have a much better shot at taking the honors at Ironman Texas.